Dun Aonais, Benbecula, Scotland: a prehistoric artificial island. 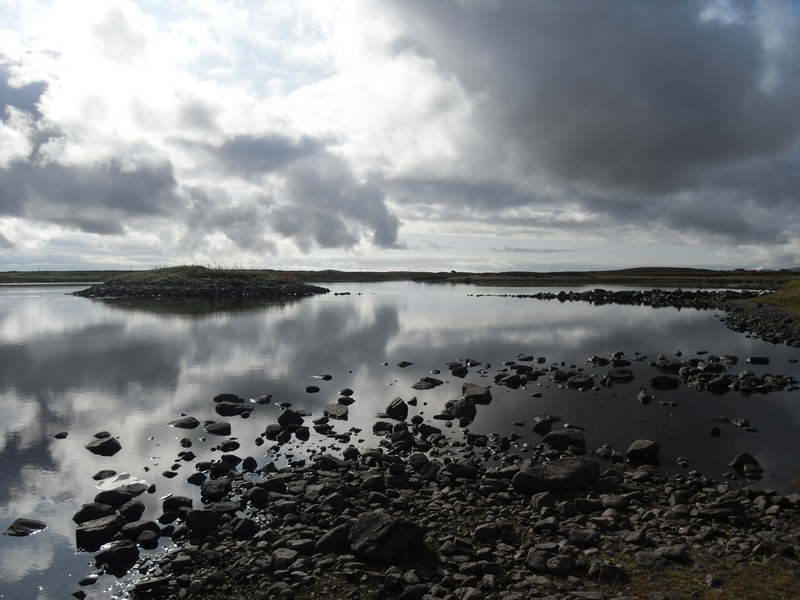 This page is a draft of a recently released publication: 'The Island Dwellings of North Uist: Five Millennia of Living on Water' which is available through the The Islands Book Trust. It is meant as a brief introduction which touches upon key aspects of the island dwelling tradition in Scotland. The second tab illustrates examples of Iron Age Hebridean pottery located during underwater investigation - some of it in quite good condition considering it is approximately 1500 to 2000 years old. The third tab is a complete bibliography of material related to island dwelling studies within Scottish archaeology.Finally, the fourth tab shows some 'screengrabs' from the free interactive GoogleEarth map - downloadable on that page. Both natural and completely artificial islands in Scottish lochs were favoured locations for human settlement for over 5,000 years. These watery settlements on small islets, generally under 30 metres in diameter and referred to as 'crannogs' (in the Gaelic language literally translated as 'small tree'), served a multitude of functions as simple homesteads, workshops, smithys, leather or pottery production centres, royal residences, places of refuge or as a neutral meeting ground between rival clans. Weddings were held on crannogs, while others held prisioners or hid freebooters. Many Hebridean island dwellings were often connected to the shore by a narrow stone causeway, while mainland crannogs generally had wooden causeways connecting them to land. Origins tend to be prehistoric in nature and their material culture indicates a settled, agrarian way of life with practically no signs of violence. To most archaeologists, the majority of island dwellings appear to be simple homesteads during the later prehistoric period, in particular the Scottish Iron Age, from approximately 700BC to AD400. Yet as we reach the Medieval Period, they do take on a noticeable degree of increasing status and appear to be largely occupied used by the middle to upper classes. This is based upon both excavation and early written records. However, this does not mean that certain groups were banned from occupying islets. Based upon the archaeological evidence throughout Scotland, living on a small islet was not restricted to a single social strata of people - excavation has indicated that island dwellers were ultimately as varied in economy and pursuits as they were in location. Ironically, despite their defensive locations, there is very little evidence of weaponry or warfare until the Medieval period, although even this is quite limited. Nevertheless, it is certain they were used occasionally as 'boltholes' or strongholds during emergencies given their inherently defensive location. It was perhaps initially surprising to early antiquarians that the vast majority of island dwellings were entirely artificial islands, literally a case of ‘building islands for building homes’. As lochs and wetlands in Scotland were drained with increasing intensity for farmland throughout much of the 18th and 19th centuries, observers began to note odd, man-made structures resembling small islands whose timbers remained in almost perfect states of preservation, including clearly visible signs of tool marks where they had been worked by rudimentary axes. In many cases, these drainage operations also revealed abandoned log boats, stone tools, Roman and Medieval vessels (in the far south west of Scotland) and even evidence of hearths where an ancient people had once gathered around. Unlike sites on land where organic materials would literally decay to dust within a few generations, these islets contained a wealth of highly-preserved material which afforded a unique opportunity to look into the past. As a sidenote today, freshwater lochs in Scotland tend to remain colder than the North Atlantic year-round, so if you want to visit, viewing them from shore is probably your best bet. However, our hardier ancestors who build them likely spent a fair bit of time in the water without much thought. If you do make it out to one, please don't climb on the walling or remove any material. They are classified as Scheduled Ancient Monuments and as such, are protected by Scottish law. In fact, if one examines 19th century photographs of Hebridean sites compared to their current state of preservation, it is clear they have largely avoided the ravages of time and human activity after abandonment. The earliest known island dwelling is Eilean Domhnuill, Loch Olabhat on North Uist, which dates back to the mid-4th millennium BC. Incredibly, Eilean Domhnuill (or Donald's 'island of strength' in Gaelic) appears to have been almost continuously for approximately one thousand years (c.3500BC-2500BC) until rising loch-levels repeatedly forced the occupants to move elsewhere. However, it was the mid-Iron Age, from 400BC to 200AD, when crannogs and island duns really saw the pinnacle of popularity in Atlantic Scotland. In the south-west of Scotland, they also witnessed use during the brief Roman interlude in the first centuries AD. Moving into the Early Historic Period (c.500AD-800AD), use is again well documented in the archaeological record until the Norse Period (c.800AD-1266AD), when island dwelling construction declines sharply. With the arrival of the Norse around 800AD, a sea-faring people whom one might imagine would adapt easily to islet life, there instead appears to be a tendency for Norse settlement to occupy central locations in the landscape, rather than marginal areas such as small islets. However, the pendulum swings the other way by the 13th century with increasing written references to islet use, while this time the occupants appear to be of increasingly higher status. In reality, this perception is likely to be more of a biased reflection from early historical documents which focussed upon the upper classes or especially noteworthy events. Island dwellings saw both long occupation spans and intermittent use lasting hundreds of years or more. In most cases, sites abandoned for centuries were re-used following a phase of site renewal. In fact, excavation has indicated re-use on every island dwelling excavated to initial occupation levels to date. This persistent re-use is indicative of a long-standing cultural tradition which did not die out easily; one which held an important place in local memory and legend. In fact, island dwellings were perhaps still in limited use in western Scotland until the early 18th century, making this arguably the longest-lived settlement tradition anywhere in Europe. In essence, what may seem a peculiar and labour-intensive undertaking to us today was repeated over thousands of years in Atlantic Scotland. In the end, major social and political upheaval took place in Scotland during the 17th and 18th centuries which disrupted the established, meaning-laden tradition of living on small islets. These events had a direct and lasting impact on the Highlander's traditional ways of life which up to that point had remained largely unchanged for centuries. During the Post-Medieval Period several key factors appear to have contributed to the decline of traditional Highland & Island life, including the relatively unique habits of 'living on islands'. -The Act of Union brought Scotland under English rule in 1707 while the suppression of the 1715 and 1745 Jacobite uprisings abruptly changed or in fact ended many traditional social aspects of Highland life for good. This was effected by the little-known Disarming Act of 1716 and the Act of Proscription in 1747 which forbade the wearing of tartan and the carrying of swords or firearms as Highlanders had for centuries before hand. A number of island dwellings were also ordered destroyed prior to this. Wearing of the kilt was banned, yet ironically this garment was apparently 'invented' in the mid-1720's by an Englishman so labourers on his Scottish estate could move about more easily! This new garment was most likely a revised version of the traditional Highlander dress - there are several conflicting accounts as to the origins of the kilt. -The notorious Highland clearances-many with the financial means voluntarily emigrated early on - many more of lesser financial means steadily followed or were physically forced off of the land later. -The dissolution of the 'tacksman', or middle class, who managed and interacted with the lower classes for landowners and clan chiefs, changed the face of social interaction amongst the inhabitants. It is suspected that many tacksmen in the Hebrides lived on island dwellings well into the Post-Medieval Period. This dissolution was politically formalised by the Heritable Jurisdictions Act in 1746 which removed the power of Clans to self-rule. -Later, the Industrial Revolution signalled a shift towards the cities for many poorer working class families as they were forced off their ancestral lands; this exodus further diminished Highland populations and fragmented previous social structures. -Finally, the effects of the 'Little Ice Age' from c.1500AD to c.1850AD perhaps made already marginal areas of farmland or grazing no longer viable, although this interpretation should be used carefully in specific site or landscape studies. Island dwellings can be found in Ireland and Scotland, with one Welsh example at Llangorse Lake. Ireland has over a thousand crannogs, but their popularity didn't peak until after Scottish examples. Crannogs also appear to see limited use in Ireland during the Norse Period as well, although there are several examples of Norse artefacts appearing on Irish sites. This shift back and forth across the Irish sea in popularity during different times has never been convincingly explained, yet it is certain there was constant contact between the two area. On a clear day one can see both the Isle of Man and Northern Ireland from the Mull of Galloway, therefore ancient peoples would always have been aware of their not-so-distant neighbours on the periphery of daily life. Sites in the Somerset marshes of England have been referred to as crannogs, yet they appear to be lake-side or wetland settlement, not islands. Oddly, areas such as the Lake District do not contain lake-dwellings, despite having ideal conditions while across the Solway Firth there exists a high density of crannogs in south-west Scotland. There are also many examples of lake-dwellings in Alpine areas of Europe, most notably in Switzerland at Lake Neuchatel, yet these appear to be seasonally flooded shore based sites, not islands. However, recent evidence from Ulrich Ruoff indicates that Bronze Age stilt-houses were permanently built out in the Lake of Greifensee, at Böschen in the Canton of Zürich. Scotland itself contains approximately 350 sites currently classed as crannogs, while at least another 160 sites in the Western Isles are classed mainly as 'duns' (Gaelic for 'fort'). These duns can also be referred to as 'Atlantic roundhouses', a term introduced by the archaeologist Ian Armit to cover the entire range of robust, drystone built structures in later prehistoric Atlantic Scotland. In all, there are some 570 island sites in Scotland. However, the highest density by far is found on North Uist in the Western Isles. Here, over 80 island dwellings are found within 300km2, or roughly one per every 3.75km2. Mainland areas such as Argyll and Dumfries and Galloway also contain high densities, although nowhere near that of the Western Isles. In areas such as Sutherland the number drops off sharply, yet surveys have not been as complete as in populated areas to the south; therefore a strong chance remains of additional undiscovered sites. The east coast of Scotland also contain very few known or confirmed crannogs in contrast to the western, Atlantic areas. In the east, they tend to be of Medieval or later date indicating construction after 'Scotland' became largely united around the 9th century. In treeless areas such as the Western Isles, stone was the only practical material available to build causeways, artificial islands or structures on natural islands. As the Gaelic term 'crannog' implies the use of wood, many scholars have not used this term for island dwellings in the Hebrides despite a tremendous amount of overlap in physical and conceptual similarities. This has led to some confusion amongst archaeologists about what is a 'real' crannog. It has also unfortunately led to Hebridean sites being studied largely in isolation from their mainland counterparts, despite fundamentally sharing an identical concept - living on water. Although within eyesight of the Scottish mainland, in many ways the Western Isles are a different world, both in the archaeological and geographical sense. Water presents a strong presence within the landscape of this island chain which contains over 7,000 lochs and lochans. To put this figure into perspective, the Western Isles make up only 1.3% of the United Kingdom’s landmass, yet covers some 15% of the freshwater surface area, over eleven and a half times the average found elsewhere in the UK. This landscape, often littered with shallow lochs dotted with reefs and small natural islets, presents ideal conditions for the occupation of small islands. Ian Armit relates in Beyond the Brochs, “The Western Isles exist on the periphery of archaeological awareness: a forbidding tangle of brochs, duns, galleried duns, island duns, wheelhouses, etc.” While this sentiment may hold an element of truth, it must be remembered it is the archaeologist themselves who have created these terms, potentially leaving readers (if not fellow scholars) awash in a confusing sea of categories and sub-categories. However, the term crannog has remained the most recognisable and popular name throughout Scotland and Ireland. The historically intended meaning of the word 'crannog' is one of debate and uncertainty, not having appeared in written records until sometime around the 13th century. It is commonly associated with the Gaelic prefix crann- which has been likened to a form of timber or wood and as such, archaeologist have generally restricted the term to only those sites which contain an element of timber. Rather confusingly, the term crannog is not commonly used in reference to Hebridean island dwellings despite the overwhelming similarities to mainland sites-this is primarily due to a widespread insistence among archaeologists that proper crannogs should contain a timber element. The crux of the 'crannog debate' is this: in the Hebridean landscape builders would simply not have had the option of using large quantities of timber. All told, despite definitions which separate Hebridean sites from mainland islets, they are fundamentally the same concept-people living on small islets. For archaeologists that take on the complexities of island excavation the results can far exceed those commonly found on dry sites. Large amounts of waterlogged remains including timber posts, wooden bowls and eating utensils, organics such as leather and textiles and even food residue remain in a near-perfect state of preservation. The low oxygen content in lochs also helps to create ideal anaerobic conditions that inhibit the growth of bacteria which normally destroys organics deposited on land. However, once taken from their protective surroundings and exposed to air, these delicate artefacts must be quickly conserved or they will perish, often in a matter of hours. The best approach is to keep them immersed in water from the loch or leave them in place unless removed for laboratory conservation and analysis. The people who built these watery niches for their homes would have been hearty souls who tolerated cold and harsh conditions that would easily put most people off today. Besides using simple boats in their efforts, crannog builders would have swam in the lochs or probed the lochbeds with long poles and sounding weights, learning the topography of the loch bed before picking a suitable spot. Indeed, underwater investigations reveal many are perched adjacent to steep drop-offs indicating an intimate knowledge by the builders of what lay beneath the dark waters. Island dwellings are normally connected to the shore by a narrow causeway or path which often curves or ‘zigzags’. This is typically regarded as a means of making access tricky for unwelcome visitors although it can also simply reflect the easiest route along the lochbed to build. Hebridean causeways in particular represent a marvel of engineering, often incorporating stones up to a metre in length to effectively create an underwater wall. Dun Ban in Loch Hornary, with its gracefully curving 'S' shaped causeway using stones up to a half ton or more in size, is perhaps the finest expression of this craft which displays the elaborate methods and proficiency of the builders. The buildings which sat atop Hebridean islets took varied forms over the ensuing millennia, ranging from simple sub-circular stone enclosures to elaborate brochs in the Iron Age with complex double walling locked together with cross-slabs and ground floor galleries. Hebridean island dwellings are also home to several wheelhouses which commonly date to the early centuries AD such as Eilean Maelit, North Uist, with their distinctive radial interiors. Moving into the Medieval and Post-Medieval Period, this tradition once again witnesses a resurgence in popularity. Dun Raouill or Dùn Raghnaill in Loch Druidibeg, South Uist was built with a small castle. Today the substantial upstanding remains are very prominent in the landscape and can be spotted from a great distance. A general rule of thumb for settlement in Atlantic Scotland-if the building foundations are circular, they very likely are prehistoric in nature as circular forms dominated up to at least the mid-first millennium AD. However, excavation is still the surest way to determine this as much later 'hip-walled' blackhouses from the 18th century have occasionally been mistaken for prehistoric settlements at first glance. Research for this project was possible due to the generous support of the 2010 GAMA award which commemorates the work of Herbert Gatliff and Angus MacLeod. Many thanks also goes to the Gatliff Trust which operates rustic hostels in the Western Isles. The Gatliff trust hostels are located in some of the most scenic landscapes in the Hebrides and collectively make for an unforgettable stop. Below is a through bibliography of key texts on later Scottish prehistory, regional Scottish archaeology and island dwellings if you would like more information. Key texts are listed as 'Highly Recommended'. Armit, I. 1992. The Later Prehistory of the Western Isles of Scotland; Oxford: BAR Brit Ser. 221. Armit, I. 1996. The Archaeology of Skye and the Western Isles, University Press, Edinburgh. Armit, I. 2003. ‘The Drowners: permanence and transience in the Hebridean Neolithic,’ in Armit, I, Murphy, E. and Simpson, D (eds.) Neolithic Settlement in Ireland and Western Britain, Oxbow, Oxford. Beveridge, E. 1903. Coll and Tiree: their prehistoric forts and ecclesiastical antiquities with notices of ancient remains in the Treshnish Isles, Edinburgh. Blundell, F.O., 1909. ‘On Further Examination of Islands in the Beauly Firth, Loch Bruiach, Loch Moy, Loch Carry, Loch Lundy, Loch Oich, Loch Lochy, and Loch Treig.’ Proceedings of the Society of Antiquaries of Scotland Vol. 44 pp.12-33. Blundell, F.O. 1913. ‘Further notes on the artificial islands in the Highland area’, Proceedings of the Society of Antiquaries of Scotland, vol. 47, pp. 257-302. Campbell, E. 1999. Saints and Sea-kings: The First Kingdom of the Scots, Historic Scotland, Edinburgh. Cavers, M.G. 2010. Crannogs and Later Prehistoric Settlement in Western Scotland, BAR British Series. Crone, B. A. 1993. ‘Crannogs and chronologies’ Proceedings of the Society of Antiquaries of Scotland, vol. 123 (1993), 245-54. Crone, B. A. 2000. The History of a Scottish Lowland Crannog: Excavations at Buiston, Ayrshire, 1989-90, STAR Monograph 4, AOC/Historic Scotland, Edinburgh. Crone, B. A. & Campbell E. 2005. A Crannog of the First Millennium AD: Excavation by Jack Scott at Loch Glashan, Argyll, 1960. Society of Antiquaries of Scotland, Edinburgh. Fredengren, C. 2002. Crannogs: a study of people's interaction with lakes, with special reference to Loch Gara in the North West of Ireland, Wordwell, Bray. Harding D.W. 2004. ‘The Iron Age in Northern Britain: Celts and Romans, natives and invaders’ Routledge, London. Harding, D.W. and Dixon, T.N. 2000. ‘Dun Bharabhat, Cnip: an Iron Age settlement in West Lewis’, Calanais Research Series No.2, Department of Archaeology, University of Edinburgh. Henderson, J. C. 1998, ‘Islets through time: the definition, dating and distribution of Scottish crannogs’, Oxford Journal of Archaeology, vol. 17, no. 2, pp. 227-244. Henderson, J.C. 2007. The Atlantic Iron Age: Settlement and Identity in the First Millennium BC, Routledge, London. Holley, M. 2000. The Artificial Islets/Crannogs of the Central Inner Hebrides, BAR British Series 303. James, S. 1999. The Atlantic Celts: Ancient People or Modern Invention? British Museum Press, London. O'Sullivan, A. 1998. The Archaeology of Lake Settlement in Ireland, Discovery Programme, Dublin. Parker-Pearson, M., Sharples N., Mulville, J., Smith, H., 1999. Between Land and Sea: excavations at Dun Vulan, South Uist, SEARCH, vol.3, Sheffield Academic Press, Sheffield. RCAHMS, 1928. Ninth Report with Inventory of Monuments and Constructions in the Outer Hebrides, Skye and the small isles, Edinburgh. Thomas, F.W.L. 1890. ‘On the Duns of the Outer Hebrides’ in: Archaeologica Scotia, vol. 5, pp. 365-415.